Buell has stopped production of its tubular framed large capacity bikes to concentrate all its efforts on making the new alloy beam framed Firebolt. It means the end of the line for the Cyclone, Thunderbolt and Lightning twins. The focus will now be on bikes based around the alloy chassis. Buell has a tradition of using one model as a basis then developing parts around it to create variations, usually with minor cosmetic changes and slight engine modifications. Sources close to the factory believe that the new Firebolt will be used as a basis for a future range. Buell founder Erik Buell refuses to comment on that possibility, but did say: " I can confirm that we have decided to concentrate on the Firebolt, and it will replace the current models. It went into full production last week. " 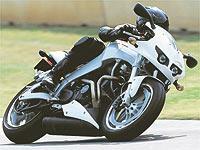 Buell has not completely abandoned the tubular frame. It will continue to be used in the the 492cc air-cooled single cylinder Blast, which isn’t imported to the UK. Buell also revealed that he has no plans to use a water-cooled motor in any Buell. This story was broken to MCN2U subscribers on Tuesday afternoon. Were you among the first to know? Find out how you could be by following the link, right.